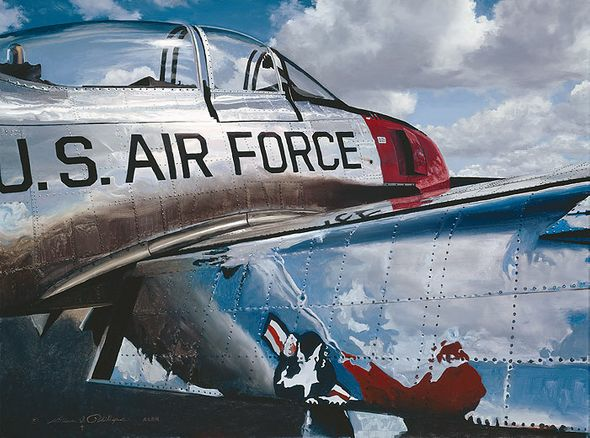 William Phillips Hand Signed and Numbered Limited Edition Canvas Giclee :"Air Force Reflections"
Edition: Artist Signed and Numbered, Limited to 45 total editions. COA included. About the Art: Flaps down, aluminum gleaming, this polished T-28A Trojan reflects the sun, the sky and even itself. The promise and glory of flight seethes from every rivet on this aircraft's metal skin. From 1950s to the mid-80s many an Air Force, Navy and Marine Corps aviator flew this high performance trainer on the way to bigger and faster aircraft. Yes, it's a trainer, but it's hardly a quiet, retiring schoolmarm. The Trojan, with a Wright R-1300 engine, had a top speed that often exceeded 280 mph. In 1962, North American began building Trojans for a combat, counter-insurgency mission. Six under wing hard-points were added in order for the aircraft to accept a variety of weapons. This version of the T-28 saw action in both Southeast Asia and North Africa. Air Force Reflections is a Fine Art Giclée Canvas that captures the unbridled joy of flying without ever leaving the ground. Generations of pilots' first taste of the wild blue yonder came to be in the cockpit of this piston-powered warbird.